Energy efficiency measures financed with the GGF loan are projected to result in annual primary energy savings of almost 50,000 MWh and CO2 emission reductions of nearly 15,000 metric tons. Luxembourg and Skopje, January 5, 2017 - The Green for Growth Fund (GGF) has lent EUR 10 million to Halkbank Skopje to increase energy efficiency (EE) in Macedonia. The loan is the fund’s third to Halkbank Skopje since 2010, when the lender became the first in the country to offer EE financing products. The latest investment further solidifies this successful, long-standing cooperation and reflects Halkbank’s proven track record of promoting the reduction of energy use in Macedonia. The GGF loan will enable Halkbank to increase the scope and volume of its Eco-loan products, which can be used for financing EE measures at Macedonian businesses, for replacing obsolete agricultural equipment on farms, and for outfitting homes with technologies that lower energy use. In addition, the latest loan includes GGF technical assistance that will support both Halkbank’s sales and promotional activities and the development of further EE loan products. The Green for Growth Fund invests in measures designed to cut energy use and CO2 emissions by a minimum of 20% in 19 markets across Southeast Europe, the Caucasus, Ukraine, Moldova, the Middle East and North Africa. The Fund provides financing to local partners that on-lend to enterprises and private households, and it invests directly, primarily through the contribution of senior debt, in renewable energy projects. The GGF’s Technical Assistance Facility maximizes the Fund’s investment impact through support for capacity building at local financial institutions and partners. Halkbank AD Skopje (Halkbank) is raising the bar for speed and quality in financial services within the Macedonian market by implementing innovative processes in its business. With 36 branches in Macedonia, correspondent relationships with over 400 banks and account relationships with 13 foreign banks, Halkbank has a broad national and international network. A large-sized bank by NBRM standards, Halkbank enjoys a sterling reputation as a trustworthy, customer-oriented, innovative and dynamic bank in the Macedonian market. Halkbank is also a socially and eco-responsible institution: since its beginnings in Macedonia, the bank has continuously supported environmental development and protection, many socially concerned segments, as well as sports and culture. In the area of long-term development financing in particular, the bank has long-term partnerships with international financial institutions that are benefiting the Macedonian economy as a whole. In 2015 Halkbank showed continuity in supporting the real economy, while the quality of the offered services remained high. The loan portfolio of the Halkbank showed an increase from EUR 275.7 million to EUR 335.5 million, or 21%. The overall net growth of lending to Macedonian companies and citizens was EUR 392 million, where Halkbank had a leading share of 15.2%, or EUR 59.8 million in nominal terms. 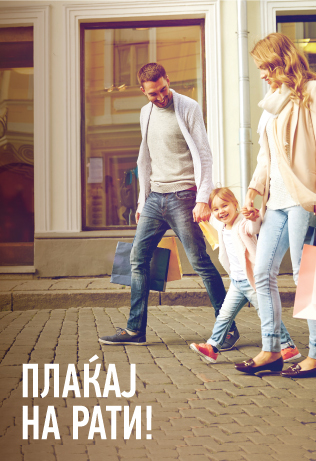 For more information, please visit http://www.halkbank.mk.